I have been investing in dividend stocks for almost 9 years now. And in that time, I have learned a bunch about building a low-risk portfolio of stocks that will earn our family income. I still have plenty to learn, but also feel I have plenty to share with others. One person who I hope to teach everything I know about dividend stocks to is my oldest son … who just became a teenager. My son is eager to learn the skills it takes to start and grow his own dividend income portfolio. I couldn’t be happier to teach him what I know and help him start his little money making machine. If I would have been able to start my portfolio in my teens, just imagine where I would be today? Instead, I started in my mid 30’s … which is still better than nothing. But hopefully I can convince all of my children to start much sooner than I did. Anyways … with all this talk of helping my son learn the tricks of the trade, I decided to put together a list of important dividend ratios and calculations he needs to learn. 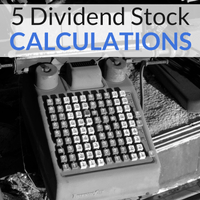 The following 5 dividend calculations/ratios are used daily in building our portfolio of stocks. The yield of a stock is likely the first thing dividend growth investors look at when analyzing a company. This ratio is a way to measure the return on investment a shareholder can expect in dividends for owning a stock. Dividend yield is calculated by dividing the annual dividends paid out by the current share price. It is constantly changing as the share price of a stock goes up and down. The yield will also change if a company decides to increase or lower their dividends. For more information, check out How to Calculate Dividend Yield. Note – When searching for stocks for the Money Sprout Index, we used to look for companies with a dividend yield greater than 2.5%. We have recently lowered this threshold to stocks with a yield greater than 2.0%. The dividend payout ratio (DPR) of a stock is the percentage of earnings that are used to pay dividends. This is another important tool used by investors to screen for quality dividend stocks. The ratio informs investors how well a company’s earnings can support future dividend payments. The higher the ratio, the more risky the future dividend usually is. A lower ratio normally points to a company that has plenty of cash to support future dividend growth. For more information, check out How to Calculate the Dividend Payout Ratio. Note – When searching for stocks, we look for stocks with a DPR less than or equal to 60%. Anything higher is usually a red flag that there could be trouble on the horizon for a dividend. Without question, yield on cost (YOC) is my favorite of all dividend stock calculations. Once you purchase stock in a company, the dividend yield is useless for those shares. Remember that the dividend yield calculation uses the current share price … which is constantly changing. So if you purchased your stock for $20 a share last month, and they are now trading at $25 … the dividend yield has decreased. This is assuming the annual dividend has remained the same during that time. The yield on cost (YOC) uses your average share price you paid to own the stock. So instead of using the current share price (i.e. $25 from the example above), it uses your share price (i.e. $20). There are other factors to also consider when looking at yield on cost. For more information, check out How to Calculate Yield on Cost for Dividend Stocks. My wife and I have one stock that now has a yield on cost over 10%! We also have several other company’s that are yielding over 7%. In order to reach those level of returns, you will need to invest in quality companies and hold onto shares for many years. Dividend growth rates help investors understand the history of a company raising their dividends. While not guaranteed, a history of strong dividend growth could mean future increases are likely. Also referred to as DGR, the value is the annualized percentage rate that a stock’s dividend has seen over a set period of time. Some of the more common time periods for calculating these growth rates include – 10 year, 5 year, 3 year, and 1 year. For the majority of our portfolio, we look for 10 year dividend growth rates of 6% or higher. Picking stocks with this criteria means that overall, we should expect to see a 6%+ raise on our dividends each year. It is important to remember these increases are not guaranteed and only represent past performance. Successful dividend investors have a knack for combining the dividend yield with past growth rates to find the best stocks for future increases. Another calculation that we track with our portfolio is the forward dividend income. It is not as commonly talked about compared to the other calculations and ratios listed above. However, I find it very helpful as we build our portfolio of dividend stocks. The forward dividend income is calculated for a stock by taking the number of shares you currently own and multiplying it by the annual dividends. For example, we currently own 50 shares of Emerson Electric Co. (EMR) at the time of this writing. The current annual dividends for the company is $1.92 per share. So our future dividend income for EMR is = $96.00. The forward dividend income assumes that the company you own will not lower their dividend in the next 12 months. If they do, then the future dividend income will be lower. One last thing about forward dividend income … we calculate this value for all the stocks we own individually. Then we add up the totals to get our overall projected dividend income. At the time of this writing, our future dividend income for our portfolio is $2,185. This number helps us set our goals and expectations for building our dividend income stream. When it comes to investing in dividend stocks, investors must have a plan. They need to know what types of stocks to buy and add to a portfolio. Investors should also know when to sell a stock from their portfolio. In order to make these decisions, it is important to leverage different tools and calculations. The 5 dividend calculations and ratios listed above are a few of the tools I use everyday to build our portfolio. There are several others that could be added to the list … but these are the most important to us. I feel that every dividend investor must understand these in order to have success. Do you use these calculations? What other ratios and tools can you add to this list? Full Disclosure – At the time of this writing, we owned shares in the following stocks noted in this post – EMR. The material above is not a recommendation to buy. Please do your own research on a company before deciding to invest.